But you always go in the most interesting directions. Okay, just to keep from killing this thread, let me offer some help. The era is the 1960's, hence the thick eye makeup on the prone lady. And this is not an American film. I think that this might be "Wild Wild Planet." Unfortunately, not many people seem to know that movie, but it's a pretty groovy flick. Not "Wild Wild Planet". But after looking it up, I now want to see it...badly. Thank you for opening that door, Andrew. Any idea where it can be found? Oh, here's another hint: That blue tinting? That is actually in the movie. This photo has not been doctored to throw anyone off. If you used to watch Night Owl Theater in Tulsa, Oklahoma back in the 70's and 80's, you may have seen this weird little film. That's where I saw it originally. That picture rings a bell, and I thought it had to be from "Wild Wild Planet." I wonder if the period and the man with the glasses just made my brain connect the two, or if I've seen the film that the picture is actually from. Watched a lot of late-night TV shows in the 80's. To my knowledge there is not any legitimate release of "Wild Wild Planet" available. I have it on a laserdisc that I picked up years ago. It's a crying shame that the film is so hard to find. TCM occassionally airs WILD WILD PLANET. They played it only a couple of months ago, but I missed my chance to record it. Boy, that photo does look familiar. For some reason I'm thinking its one of those odd 60s Japanese sci-fi films. Figures. I don't have cable. Damn it. I really want to see that movie now. This particular movie isn't Japanese. And I'm straining to think of hints that won't give it away. But then, hell, I wonder how many people have actually seen this movie. Okay, one major hint: Think vampires. Filipino flick THE BLOOD DRINKERS aka VAMPIRE PEOPLE (1964/66). The weird color was a good hint. Thee were several "color" Filipino horror films which used lots of tinted B&W footage. I've seen all of the Eddie Romero 'Blood Island' flick (BRIDES OF BLOOD is my favorite, although BLOOD BEAST/TERROR IS A MAN is technically the best of the lot), but not any of those vampire flicks. I'll have to look 'em up. Or maybe there's just one Filipino vampire movie but with lots of alternate titles. You are persistent. And correct. I remember watching this thing late one night and being bewildered by the tinting and surprising amount of bloodshed. Fun movie. But it is based on a novel by a famous American author. 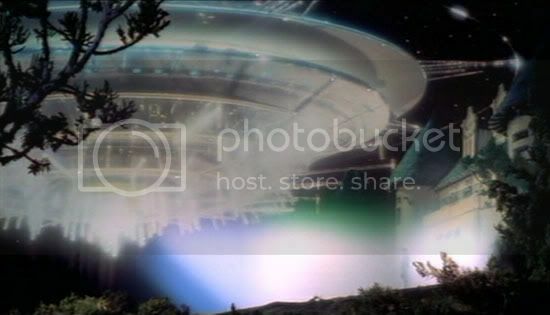 Save for the fact I don't recall a scene like that in CLOSE ENCOUNTERS OF THE THIRD KIND I'd have guessed that pic was from it so, uhm, er maybe. .